Around the turn of the millenium cellist Yo Yo Ma began gathering musicians from nations that were part of the ancient silk road trade network. From the beginning there were two reasons: the first was to see what music could be made with these combinations of instruments. And the second was to show an example of radical cultural collaboration as a model for things outside of music. 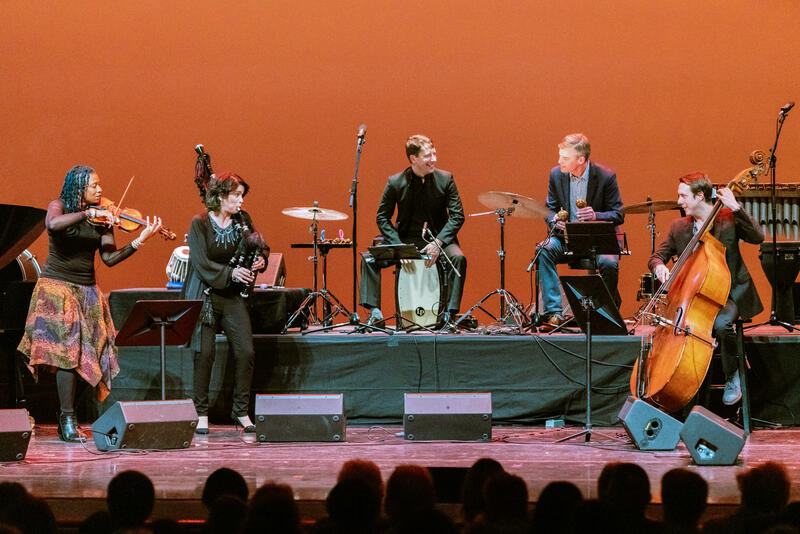 Percussionist Joseph Gramley, who has been with the Silkroad Ensemble since the beginning, describes the mission as one of engaging each others' differences. He said the groups seeks "to embrace each other - to make music that crosses borders and begins conversations." And these conversations can lead to what Gramley calls a "pathway of trust." Silkroad Ensemble has since expanded to include a collection of performers from across the world - allowing for unexpected pairings of players to learn from each other where their sounds can fit in the musical world. Bassist Shawn Conley says that this has even allowed him to challenge his own technique. He described rehearsing Tarang by tabla player and fellow Silkroad member Sandeep Das. Conley said that while his own jazz background leaves him fairly comfortable with complex rhythm, he admitted that it took him a while to settle in. "There's all this rhythmic interplay between the group that for me and others takes a long time for us to get comfortable with." But that is the theme of the piece itself. Tarang, which means "currents," puts a western string trio in conversation with four nonwestern percussion instruments. Each tries to speak the language of the others - a musical portrayal of silk road merchants, with their different languages, still trying to communicate with each other. Both Das and Conley are used to improvising. But many of the tala, or rhythmic cycles that form the structure for Indian classical music, are much longer than those of western music. Plus, they aren't made out of patterns of strong and weak pulses to which western musicians are accustomed. So, for Conley, it's been an especially fun challenge. The ensemble works off of a variety of notation styles. Some of the music is fully written out, some is improvised, and some is realized. Avant garde composer John Zorn's Book of Angels is a set of melodies written in lead sheet form - giving the performers the freedom to create their own soundscape. Each melody the group interprets from Book of Angels is taken individually. Given the unique set of players, this flexibility allows them to reimagine pieces of music that may even be considered standard pieces of western repertoire. For example, the group's interpretation of Henry Purcell's O Solitude, which captures the essence of the original, while also having the intimacy of treating Purcell as a songwriter. Conley describes the piece, which features soprano Nora Fischer, as "trying to blend those two works, and have it feel like a fireside folk song with hopefully the original intent still intact." Some of the performance is not notated at all. The ensemble interprets a piece of 21st century marimba repertoire as a percussion ensemble piece. Ghanaia by Matthias Schmitt is a piece by a German composer, for a Ghanaian instrument which has been tuned in a western chromatic scale. Silk Road adds African, Indian, and Middle Eastern ryhthms on top. This act of making the piece a citizen of the world was described by Joseph Gramley as total fun. "It's the interplay. It's the fun. It's the laughter. It's the communication between the drummers and the marimba player that make the piece really special." For audiences, the effect of putting these players, these instruments, and these pieces of music together is instantly apparent. And it's particularly the example of collaboration, listening, and curiosity that the group hopes will lead to an overall more hopeful and inclusive society. Silkroad Ensemble performs at the Schermerhorn Symphony Center on Monday April 1 at 7:30pm. After five rounds of voting we have our March Music Madness winner.